Help Chinese immersion students practice vocabulary with this simple and fun activity. Laminate, cut, and add a sticker, then provide some clothespins and students are ready for a literacy center activity. 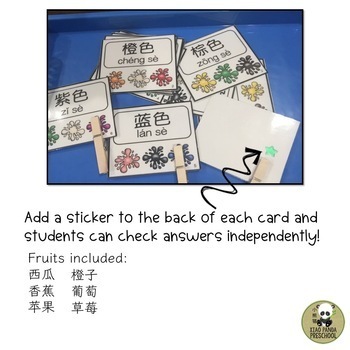 Simplified Chinese characters with pinyin support and colorful visuals combine with the action of clipping provides a multi-sensory practice allowing all students to benefit and learn. 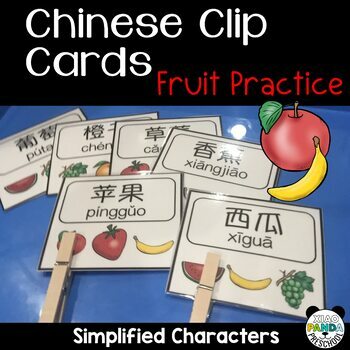 This activity is available at a discounted sale price as part of my Chinese Clip Cards GROWING BUNDLE. It includes all my current AND future clip card creations! The earlier you purchase, the more $$ you save!